Nineteen Sixty-four: Where is Catholicville, USA? Somewhere in the country is a place more Catholic than anywhere else. Baltimore? New Orleans? Chicago? Capistrano? Boston? St. Augustine? South Bend? This is CARA so we have to go where the data lead us rather than rely on anecdote, history, or tradition. Below we explore data from the U.S. Religion Census, The Official Catholic Directory, CARA’s own databases, and Google Trends. 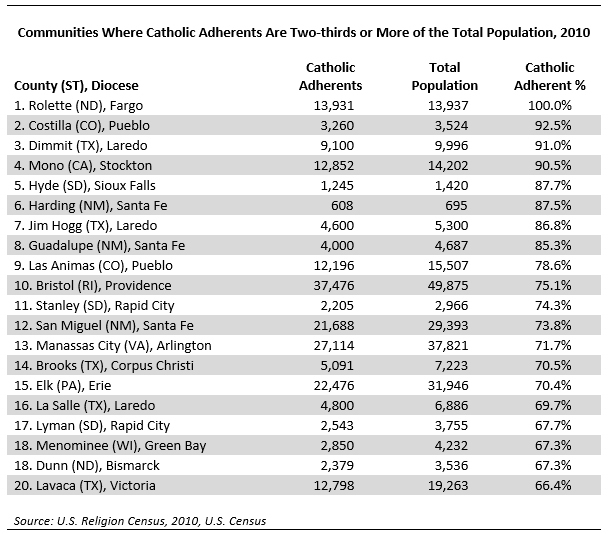 The table below shows the counties where Catholic adherents (i.e., those who are known in some way to each Catholic parish or mission in the area) make up two-thirds or more of the total population. Surprise! Rolette, North Dakota in the Diocese of Fargo is a contender for Catholicville. Here, adherents are almost as large as the entire Census population of the county. This area is home to the Turtle Mountain Indian Reservation of the Chippewa Indians. The reservation’s total lands are spread across 22 counties in North Dakota, South Dakota, and Montana and Rolette is a center for the community. In the Religion Census, which measures adherents of all different faiths, it is explained that these large adherent shares of the population in a county (even at times exceeding 100%) can sometimes occur when the adherents’ counties of residence differ from their county of church membership. This seems the likely case here with the Chippewa community. Thus, practically speaking, it may only really be Catholicville when people are drawn from outside the county to Rolette’s parishes for worship or some other event. Next on the list is Costilla, Colorado in the Diocese of Pueblo. This is a region just on the border with New Mexico where adherents are an estimated 92.5% of the total Census population for the county. A small population of only 3,524 live here and 62% self-identify as Hispanic or Latino. This is a rural and agricultural area that more recently has attracted people seeking to “live off the grid” as well as tourists. The Colorado Encyclopedia notes, “Spanish-Catholic Americans often visit the area as religious tourists; local historic churches and art galleries draw in thousands each year. Another attraction, the Stations of the Cross Shrine, is an ornate collection of statues depicting the crucifixion of Jesus. The shrine was designed by Huberto Maestas and installed by Father José Máximo Patricio Valdez and his followers in 1986. The area is also a purported hotspot for paranormal activity, and draws tourists interested in UFOs, la Chupacabra, and other alleged phenomena.” Any area with a small population that is drawing in tourists and pilgrims can, at times, have a larger number of people in the pews than would seem conceivable given the number of permanent residents. 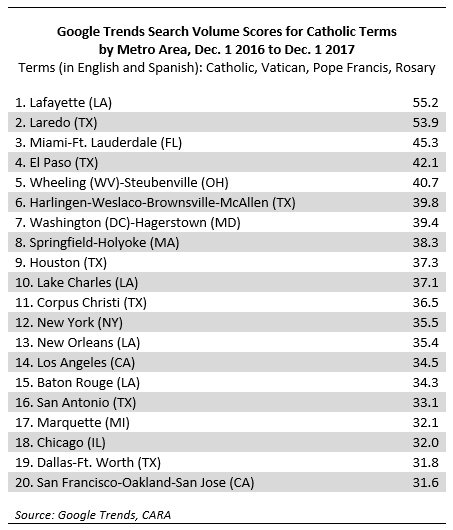 In The Official Catholic Directory, the dioceses of Brownsville, Laredo, and El Paso in Texas report the highest shares of populations as Catholic (85%, 91%, and 80%, respectively in 2017). All three of these dioceses are on the border with Mexico. 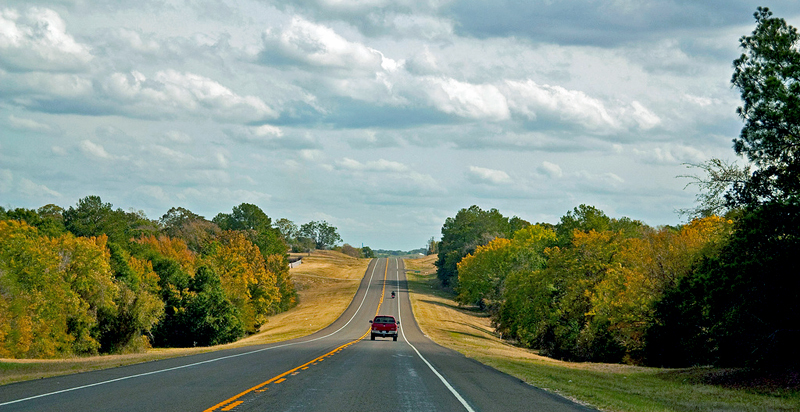 Counties from the Diocese of Laredo appear in the top rankings of the U.S. Religion Census but none are present in these data from the dioceses of Brownsville or El Paso. In practice, every diocese estimates its Catholic population a bit differently. Some seek to measure self-identified Catholics (a larger number) and others attempt to estimate the number of parish-affiliated (closer to the concept of adherents). In examining the U.S. Religion Census data for 2010, CARA noticed that counties in the dioceses of Brownsville and El Paso include large numbers of people who are “unclaimed” by any religious congregation (i.e., the remainder when the U.S. Religion Census subtracts the memberships of all congregations in a region from the total U.S. Census population). For example, in Starr County Texas in the Diocese of Brownsville, there are more unclaimed people than the total of all religious adherents in that area. These border dioceses include counties where large portions of the population self-identify as Hispanic or Latino (which are also typically under-counted by the U.S. Census). In CARA’s national surveys we also know Hispanic or Latino Catholics are less likely to register with a parish than on-Hispanic white Catholics. In Starr County, 96% of the total population self-identifies as Hispanic or Latino. In sum, CARA believes that there are many Hispanic Catholics who do not register with a parish as a member, but who are practicing as an “adherent” in border areas of Texas. These populations appear to be missed as “adherents” in the 2010 U.S. Religion Census. in the previous table we have added CARA’s estimates for additional counties where Catholic adherents are prevalent and thus should also be present among “the most Catholic” discussion. 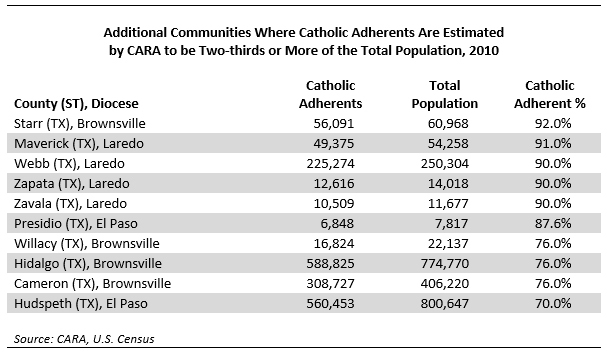 It is also important to note that the total Catholic adherent population in the counties listed in the two previous tables represents a mere 2 million of the total U.S. Catholic adherent population. In sum, having a population that is mostly Catholic in an area is one thing. What they are doing matters as well in determining where Catholicville might be. The table below shows the 20 dioceses in the country that are the most “sacramentally active.” By this measure, Catholicville could be Tulsa. Dioceses with the most Catholics tend to celebrate the most sacraments. CARA compares dioceses by looking at sacramental rates per 1,000 parish-affiliated Catholics to control for the different sizes of dioceses (for ordinations we look at rates per 10,000 parish-affiliated Catholics). For example, in the United States in 2016 there are 10.6 baptisms of minors, 10.3 First Communions, and 2.1 marriages in the Church per 1,000 Catholics. Looking across the sacraments recorded in The Official Catholic Directory (i.e., marriages, minor baptisms, adult entries into the faith, First Communions, confirmations, and ordinations of deacons and priests) we can rank the dioceses for each type that is received or celebrated in a year. We can then take an average of these ranks and create an overall “score.” In 2016, the Diocese of Tulsa in Oklahoma scored 10.5—meaning it ranked about 10th, on average, across all sacraments for which data exist. No other diocese had consistently high ranks. Thus, the Diocese of Tulsa is, relatively speaking, the most sacramentally active Catholic diocese in the country and a contender for Catholicville. It is followed by the dioceses of Rapid City in South Dakota and Memphis in Tennessee. Looking at the rankings for the previous year, most dioceses in the table were quite similarly active in the past. There is one big exception—Memphis in Tennessee. This diocese climbed up more than 60 spots in the rankings with a significantly larger number of ordinations in 2016 than in 2015 and slightly higher rates of sacramental activity in other areas. 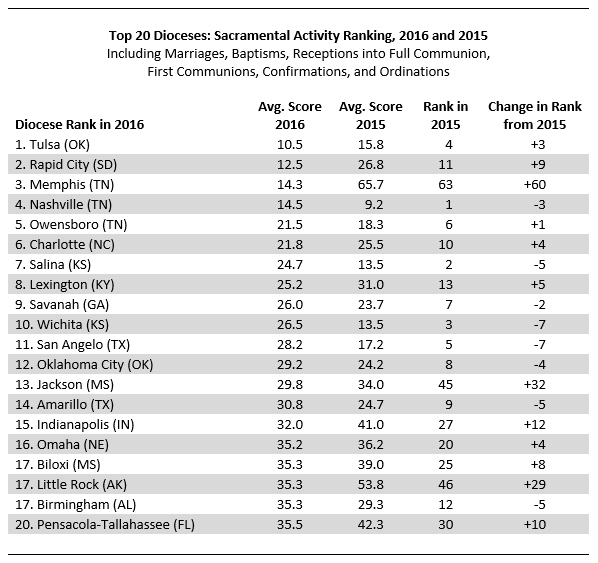 The table below shows the top dioceses in each area of sacramental activity. The Diocese of Charlotte in North Carolina appears to be experiencing growth in the number of Catholic children, leading in both minor baptisms and First Communions. In our previous post we showed that this is one of the dioceses that has many Catholics “moving in” recently and thus may be a prime destination for young families. Sacraments most often represent the activities of the parish-affiliated. These are also somewhat correlated with areas where families are more prevalent given the time in the lifecycle they are received or celebrated. Areas where there are more young people marrying and having children are going to be more sacramentally active—even when measured as a rate relative to the size of the Catholic population. What about the things Catholics do outside of parishes? Here CARA relies on Google Trends for an estimate. What are people searching for online? What about those searches are Catholic? We looked at Google searches in the last year for: Catholic, Vatican, Pope Francis, and Rosary (in English and Spanish). We then created a weighted score using the search volumes for each of these terms. The table below shows the metropolitan areas where these searches are most likely to come from. Topping the list is Lafayette, Louisiana followed closely by Laredo, Texas. There is certainly more data out there to collect and crunch to determine where Catholicville is today. Perhaps there was a time when this was somewhere along the Atlantic Ocean coastline between Baltimore and Boston. If there is one general area that appears more than any other across the tables presented above it is Texas. Louisiana also appears to be a center for Catholic presence and activity. Now Catholicville is likely somewhere along the Gulf of Mexico or along the Rio Grande. Generally, there are more areas of the geographic South noted than the North. 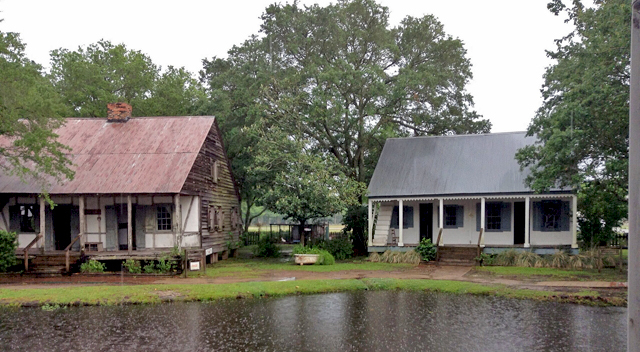 Perhaps somewhere along a southern country road you might stumble into Catholicville… before we can determine more precisely just where it is.